SAN ANTONIO (AP) The Spurs have not had many opportunities to play with a full and healthy roster this season, so they took advantage of the luxury Saturday night. San Antonio won its 14th straight at the AT&T Center, improving the league’s best home record to 19-2. The Spurs’ projected starting lineup of Leonard, Aldridge, Pau Gasol, Tony Parker and Danny Green played together for only the sixth game this season and just the second time at home. Green had 11 points in his return from a 10-game absence due to tightness in his left groin. Leonard played 28 minutes in his return, shooting 5 for 8 from the field while collecting eight rebounds, four assists and four steals. After missing the season’s first 27 games with right quadriceps tendinopathy, Leonard strained his left shoulder against Phoenix on Jan. 5. 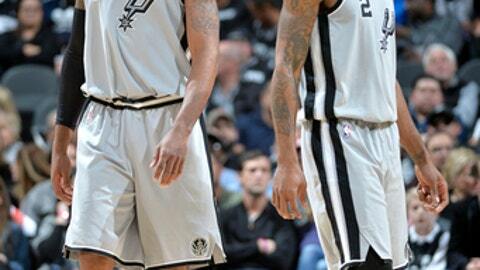 The Spurs raced to a 23-12 lead in the first quarter despite getting just one point from Leonard. San Antonio opened the game by shooting 6 for 7 on 3-pointers, including three consecutive 3s by Bertans to close that opening run. Bertans, a second-year player included by Indiana in a trade that brought Leonard to San Antonio for George Hill, had a career-high six 3-pointers. He finished 6 for 7 on 3s. San Antonio shot 14 for 27 on 3-pointers and 53 percent overall while running Denver’s defense ragged. Jokic had 23 points and nine rebounds for Denver, which has lost 10 straight in San Antonio. Nuggets: Denver was held to 11 points in the fourth quarter, a season low in the final period for a San Antonio opponent. . Denver’s last win in San Antonio was March 4, 2012, when Richard Jefferson started for the Spurs. Jefferson is now a reserve for Denver. … F Paul Millsap missed his 27th game with a sprained left wrist. … The Nuggets are 10-19 when allowing 100-plus points. Spurs: Ginobili rocked back for a left-handed dunk in the first quarter. It was his fifth dunk this season, his most since having 10 in 2014. … The Spurs have played only two home games in January, winning both. … Bertans has had three-plus 3-pointers in 16 games, second only to Gary Neal’s 24 for the most by a Spurs player in their first two seasons. Popovich was asked if commemorating Martin Luther King Jr.’s birthday on Monday holds any added significance given the unusual times America is facing now. ”It’s been a long day for me,” said Harris, who flew to San Antonio on his own. Harris had 18 points in 30 minutes. Nuggets: Host Dallas on Tuesday night. Spurs: Visit Atlanta on Monday.